How-to turn a stock Fox-body into a competition ready corner carver with suspension, big brakes and cage. Team sets up their Fox-body Mustang for the track with roll cage, buckets, rear seat delete plus trick fuel and exhaust systems. Fox-body gets new track-day skin, plus power tuning normally aspirated and supercharged 5.0 Coyotes. 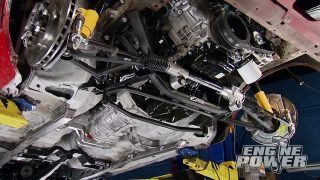 (ANNOUNCER)>> TODAY ON ENGINE POWER WE'RE TRANSFORMING AN ANEMIC FOUR CYLINDER INTO A STREET LEGAL AUTO CROSSER ON STEROIDS WITH A FORD RACING FIVE POINT ZERO ALUMINATOR VEIGHT. PLUS SEE WHAT'S COOL FROM THE MATCO TOOL EXPO. ON THE ROTTEN SMELL. NOW THE EXTERIOR IS NEEDING SOME ATTENTION TOO. THE PAINT IS ROUGH, HEADLIGHTS ARE ON THEIR LAST FLASH, AND THE BUMPER COVER NEEDS SOME ATTENTION. AFTER ALL THAT THERE WAS SOME ATTEMPT TO BE COOL. FROM FRONT TO BACK TO MAKE THIS THING A COMPETITION READY CORNER CARVER. NOW TO GET STARTED WE HAVE TO DO A COMPLETE TEAR DOWN BY REMOVING ALL THE LARGER COMPONENTS. NOW RAISE THE CAR TO DRAIN THE FLUIDS. NOW MAKE SURE YOU DISPOSE OF THEM PROPERLY. MOST AUTO PART STORES TAKE IT FREE OF CHARGE. BACK ON TOP DISCONNECT THE WIRING HARNESS FROM THE ENGINE AND ALL OF ITS COMPONENTS. OUR NEW ENGINE'S THROTTLE IS A DRIVE BY WIRE TYPE. SO THIS FACTORY CABLE CAN GO AS WELL. EXHAUST, AND DISCONNECT THE SWAY BAR FROM THE SUBFRAME RAIL. BACK ON THE GROUND RUN A CHAIN THROUGH THE SPRING AND CONTROL ARM SO THE SPRING DOESN'T FLY OUT. WITH THE STRUT LOOSE WE CAN LOWER THE JACK AND USE A BAR TO REMOVE THE SPRING FROM THE PERCH. USING A JACK TO SUPPORT THE KMEMBER, REMOVE THE BOLTS ATTACHING IT TO THE FRAME RAILS. AND RAISING THE CAR SLOWLY WILL SEPARATE THE DRIVETRAIN FROM THE CAR. TAKING THE TIME TO MAKE SURE EVERYTHING IS FREE. IS OUR NUMBER ONE PRIORITY RIGHT NOW. SO WE BROUGHT IT TO SOME OLD FRIENDS OF OURS. THEY'RE SO GOOD THEY NEED TWO SIGNS ON THEIR DOOR, BLAST FROM THE PAST IN LEBANON, TENNESSEE. A FEW HOURS HERE SAVES US A FEW DAYS OF GRINDING BY HAND. NOW THIS ALLOWS US TO SEE ANY CRACKS OR WEAKNESSES THAT MAY BE HIDING UNDER ALL THAT DIRT AND RUST, AND GIVES A SUITABLE SURFACE TO WELD TO. YOU NEVER KNOW WHAT WE'VE GOT UNTIL THE DUST SETTLES. WE'LL BE RIGHT BACK. (ANNOUNCER)>> COMING UP, BEHIND THE SCENES AT THIS YEAR'S MATCO TOOL FAIR. AND LATER WE VERIFIED THE NUMBERS ON FORD'S NEW ALUMINATOR. (MIKE)>> EVER SINCE I WAS A LITTLE KID, I COULDN'T STAY OUT OF MY DAD'S TOOL BOX. NOW IF THEY DIDN'T GO BACK IN THE RIGHT PLACE, HE WAS SURE TO LET ME KNOW. NOW RECENTLY WE SENT OUR CAMERAS TO AN EVENT WHERE THE TALK WAS NOTHING BUT TOOLS. HOLLYWOOD, SURE FELT LIKE IT, BUT THE STARS OF THIS SHOW WERE CELEBRITIES IN THEIR OWN RIGHT, TOP PERFORMERS AND THEIR FAMILIES IN THE WORLD'S FASTEST GROWING AUTOMOTIVE TOOL FRANCHISE. THE PLACE WAS SOUTH CENTRAL TEXAS AND THE COLORFUL CITY OF SAN ANTONIO, THE BACK DROP FOR THIS YEAR'S MATCO TOOL EXPO AND BUSINESS CONFERENCE. (TIM)>> THIS IS THE BIGGEST EVENT OF THE YEAR FOR MATCO TOOLS. IT'S LIKE THE BIGGEST SALES MEETING UNDER ONE ROOF FOR US AS A COMPANY. IT'S A TIME WHEN OUR FRANCHISEES GET TOGETHER, THEY SEE OLD FACES THAT THEY TALK TO DURING THE YEAR. ( )>> WE'RE THE RYANS FROM GILL, COLORADO. (LUKE)>> LUKE BENSON FROM BIG LAKE, MINNESOTA. (RON)>> RON AND JORDAN PATTERSON FROM MEMPHIS, TENNESSEE. (MIKE)>> AT THE HEART OF MATCO ARE THE MEN AND WOMEN FRANCHISE OWNERS REPRESENTING 50 STATES, CANADA, AND PUERTO RICO. OVER 1,500 OF THEM AND STILL GROWING. THEY'RE HERE AT THE EXPO FOR A COUPLE OF REASONS. NUMBER ONE, IT'S A BIG TIME PAT ON THE BACK FOR THE TOP 200 DISTRIBUTORS, THE GUYS WHO RUN THEIR ROUTES IN MOBILE STORES AND SELL TO SHOP OWNERS, MECHANICS, AND BODY MEN, ALL LOOKING FOR THE RIGHT TOOL THAT WILL SAVE THEM TIME AND MAKE MORE MONEY. NOBODY DID THAT BETTER THE LAST TWO YEARS THAN JEFF AND PAM PETERS OF ATKINS, TEXAS. MAKING THEM THE NUMBER ONE MATCO DISTRIBUTOR. (JOSH)>> MY BUSINESS IS DOING PRETTY GOOD. STARTED IN NOVEMBER. (MIKE)>> FOR JOSH CURRIE, THOSE SALES FIGURES CAN BE INTIMIDATING. (JOSH)>> JUST TRUCKING ALONG TRYING TO DEVELOP RELATIONSHIPS, TRYING TO SHAKE HANDS AND GET TO MEET PEOPLE AND TRY TO BUILD THAT RELATIONSHIP TO BE THAT NUMBER ONE TOOL PROVIDER. THE BEST PIECE OF ADVICE I'VE GOTTEN SO FAR IS SHOW UP, SHAKE EVERYBODY'S HANDS. THE NEXT THING, GREET, SELL, COLLECT. THAT'S IT, IT'S SIMPLE, SIMPLE AS THAT. (MIKE)>> SOME OF WHAT JOSH WILL BE SELLING ARE GROUND BREAKING TOOLS DEBUTED AT THE EXPO'S POWER CORRAL, LIKE THE WORLD'S MOST POWERFUL HALF INCH IMPACT WITH NEVER BEFORE SEEN TORQUE, SPEED, AND DURABILITY. UP A BOLT TO 1,300 FOOT POUNDS AND WE'RE GONNA PUT THE NEW MT 2769, AND IT'S GONNA ZIP IT OFF REALLY QUICK. THAT DEMONSTRATES BREAK AWAY TORQUE. (MIKE)>> HOW ABOUT A NEW LINE OF DUAL OFFSET COMBO WRENCHES. WHO'D HAVE THOUGHT SUCH A SIMPLE TOOL COULD BE SO DRAMATICALLY IMPROVED. WITH 15 DEGREE INDEX ON THE BOXED END, 30 DEGREES ON THE OPEN, ANOTHER EXCLUSIVE FROM MATCO. ( )>> TODAY'S CARS ARE MORE HIGHLY ENGINEERED. ANGLE FOR THE FASTENERS. IT YOU CAN GET THAT DONE, REMOVE FASTER, PUT IN FASTER, YOU'RE GONNA MAKE MORE MONEY AS A TECHNICIAN. (MIKE)>> AN AREA THAT DRAWS A CROWD AT EXPO IS IN TOOL STORAGE. ALL BOXES ARE BUILT BY US CRAFTSMEN AT THEIR JAMESTOWN, NEW YORK FACILITY. (TONY)>> LAUNCHING NEW AT EXPO THIS YEAR, FIRST AVAILABLE ON THE STREET, IS THE NEW JSC 450 AND 480 LINE OF CARTS. IT'S GOT THREE DRAWERS, NICE DEEP LID FOR HOLDING ALL YOUR TOOLS, PRY BAR STORAGE UP THE SIDE. IT'S A PERFECT CART TO START OFF WITH. IT'S A SMALLER CART AND IT COMES AT A REALLY AGGRESSIVE PRICE POINT. AND WE USE ALL THE SAME COMPONENTS AND SAME CRAFTSMEN TO BUILD THESE CARTS AS WE DO ALL OUR TOP OF THE LINE TOOL BOXES. (MIKE)>> MUCH OF WHAT'S NEW ON THE FLOOR EACH YEAR IS A DIRECT RESULT OF FEEDBACK FROM THE END USER. SHOP TECHNICIANS AARON DAVIS INTERACTS WITH ON HIS ROUTE. SUGGESTIONS THEY MAKE GO STRAIGHT BACK TO MATCO FOR IMPROVEMENT. (ARON)>> I WAS SPECIFICALLY EXCITED ABOUT OUR NEW LAUNCH DIAGNOSTIC SCAN TOOLS. THEY DID VERY WELL FOR ME FOR THE LAST TWO YEARS. EVERYONE'S USING THE iPads, iPhones, THAT TYPE OF TECHNOLOGY NOW. EVERYONE'S FAMILIAR WITH IT, IT'S SO FAST, SO FAST. IT'S ALL TOUCH SCREEN. THE MAXIMUS TWO POINT ZERO AND THE MAX GO HAVE ALL THE GREAT FEATURES THAT WE'VE HAD IN THE PAST PLUS ADDITIONAL COVERAGE. NOW THIS IS OUR NEXT LEVEL BRINGING EVERYBODY UP TO SPEED WITH A NEW ANDROID SOFTWARE. SO IT'S QUICKER, FASTER, STILL GREAT COVERAGE AND NOW WE'VE EVEN ADDED MORE FEATURES TO OUR PRODUCT SO IT'S EVEN MORE EFFICIENT AND BETTER FOR OUR TECHNICIANS. (ANNOUNCER)>> COMING UP, BESIDES A SHINY WHITE TRUCK FULL OF TOOLS, WHAT GOES INTO BEING A MATCO DISTRIBUTOR? WE'LL FIND OUT FROM SOME RISING STARS OF THE TOOL TRADE. (MIKE)>> YOU'VE SEEN THE TRUCKS, YOU'VE SEEN THE TOOLS, BUT WHAT ABOUT THE GUYS BEHIND THE WHEEL? THESE ARE INDEPENDENT BUSINESS OWNERS OF THEIR OWN MATCO TOOLS DISTRIBUTOR SHIP. THEY ARE HERE IN SAN ANTONIO, TEXAS, ENJOYING A RODEO WITH ONE THING IN COMMON, THEY ALL MADE THE LEAP TO QUIT WORKING FOR THE MAN, TO BE THEIR OWN BOSSES. (ANTRON)>> THE MORE SUCCESSFUL MATCO IS MEANS THE MORE SUCCESSFUL THE DISTRIBUTOR IS. (MIKE)>> ANTRON BROWN GETS IT. THIS NHRA WORLD CHAMPION HAS REPRESENTED MATCO FOR OVER A DECADE, AND THINKS THIS IS A GREAT OPPORTUNITY FOR ANYONE OUT THERE NEEDING A CHANGE OF PACE. (ANTRON)>> THEY DON'T GO OUT AND SAY, SIGN UP, HERE'S YOUR TOOL TRUCKS, HERE'S ALL THESE TOOLS, GO SELL THEM. NO, THEY BRING YOU IN, THEY BRING YOU THROUGH A CLASS, THEY BREAK YOU DOWN, AND THEY TEACH YOU EVERYTHING THAT THERE IS TO KNOW ABOUT THE BUSINESS, AND THEY'RE AT IT WITH YOU. THEY'RE IN IT TOGETHER. WE'RE ALL IN THIS TOGETHER AS A BIG FAMILY. (MIKE)>> YOU COULD SAY CRAIG WINEINGER WAS IN A DEAD END JOB WORKING AS A MORTICIAN. NOW HE DUG DEEP FOR A NEW CAREER. (CRAIG)>> I TOLD HERE, I SAID I'M FINDING A NEW JOB TONIGHT AND IT ALL STARTED. ASKED HER ABOUT GOING INTO A FRANCHISE AND SHE KIND OF LAUGHED AT ME. FILLED THE PAPERWORK OUT ONLINE, COUPLE DAYS LATER GOT A PHONE CALL WITH MATCO, AND HERE WE ARE NOW. (MIKE)>> TIM NOVAK STARTED WITH MATCO 30 YEARS AGO. NOW HE'S DIRECTOR OF FIELD OPERATIONS. (TIM)>> IT DOESN'T MATTER WHETHER YOU'RE IN THE AUTOMOTIVE INDUSTRY, WHETHER YOU COME FROM A PROFESSIONAL INDUSTRY OF ANY KIND. THIS IS THE ONE BUSINESS WITH NO EMPLOYEES THAT YOU CAN PUT YOUR ATTENTION, YOUR HARD WORK AND EFFORT INTO, AND REALLY DETERMINE YOUR FUTURE. ( )>> BEING A MATCO FRANCHISEE TAKES A LOT OF TIME, A LOT OF EFFORT, AND THE DESIRE TO SUCCEED. (JOSH)>> HI, MY NAME IS JOSH MELLOW, I'M A MATCO TOOLS DISTRIBUTOR AND THIS IS MY MOBILE STORE. BEFORE I BECAME A MATCO TOOLS DISTRIBUTOR I WORKED AS A AUTO MECHANIC FOR SIX YEARS AND I ALSO WORKED IN THE OPTICAL INDUSTRY AS A LAB MANAGER. WITH MY EXPERIENCE IN THE AUTOMOTIVE INDUSTRY AND SOME SALES EXPERIENCE I'VE HAD IN THE PAST, I THOUGHT IT WOULD BE A GOOD FIT FOR ME AND MY FAMILY. (AARON)>> WE JUST PULLED INTO SUBURBAN AUTO SERVICE. AKRON, OHIO, AND HE, JOSH, AND A CRAIG WILL ALL TELL YOU THE SAME THING. THEY'RE NOT JUST SELLING SHOP EQUIPMENT. THEY'RE FOSTERING RELATIONSHIPS. (AARON)>> WE BROUGHT HIM OUT TO THE TRUCK, SHOWED HIM THE FEATURES AND BENEFITS ABOUT THE NEW A/C MACHINE COMPARED TO HIS OLD ONE. WE TOOK HIS OLD A/C MACHINE IN ON TRADE, READJUSTED HIS ACCOUNT FOR THE DAY. WE SET UP THE MACHINE IN THE SHOP, SHOWED HIM HOW TO USE IT. TAKING THE TIME OUT OF THE DAY TO SET THE MACHINE UP, GIVING HIM A COMPLETE RUN DOWN, MAKING HIM FEEL COMFORTABLE WITH THAT MACHINE IS PART OF BUILDING THAT RELATIONSHIP AND THE TRUST, AND HE'S VERY CONFIDENT IN BUYING IT FROM YOU. MAKING YOURSELF MONEY, AND THAT'S WHAT IT'S ALL ABOUT. HELPING ONE ANOTHER OUT TO BE SUCCESSFUL IN LIFE. ( )>> I THINK JOINING MATCO WOULD BE A GOOD CHANGE FOR SOMEBODY THAT'S UNHAPPY OR TIRED OF THEIR CAREER BECAUSE YOU GET TO MAKE YOUR OWN SCHEDULE. YOU GET TO DECIDE YOUR OWN DESTINY. YOU GET OUT OF IT WHAT YOU PUT IN. I PUT A LOT OF EFFORT INTO MY BUSINESS AND IT'S BEEN GOOD TO ME SO FAR. YOU KNOW, I WOULD ENCOURAGE ANYBODY THAT'S LOOKING TO MAKE A CHANGE THAT HAS AN INTEREST IN TOOLS TO GIVE IT A TRY. (ANNOUNCER)>> NEXT WE'RE BACK ON THE PONY AND PLAYING WITH, WELL PREPPING IT'S NEW FORD ALUMINATOR POWER PLANT. (MIKE)>> IT'S TIME TO CONTINUE ON THE MUSTANG PROJECT. (JESSE)>> THE PONY WARS ARE DEFINITELY ON. THE BRANDX COMPETITION HAS 400 PLUS HORSEPOWER ENGINES. AND WHILE WE'VE ALWAYS DONE VERY WELL IN SHOOTOUTS AGAINST THEM, WE REALLY NEED TO HAVE THAT NUMBER, THAT OVER 400 HORSEPOWER NUMBER. 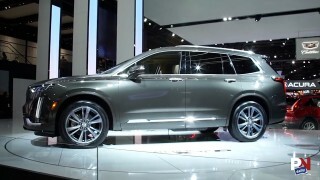 AND THE WAY TO GET IT WAS TO BRING BACK THE FIVE LITER IN A FOUR VALVE CONFIGURATION. THERE'S A PHASER FOR EACH. ON THE BOTTOM SIDE THE PAN GASKET ALSO DOUBLES AS THE WINDAGE TRAY. IT'S GOT SIX BOLT MAINS, A FORGED CRANK, FORGED POWDERED METAL RODS, AND HYPER EUTECTIC PISTONS. NOW HERE'S SOMETHING UNIQUE FOR A STOCK ENGINE. IT'S GOT OIL SQUIRTERS FOR EACH PISTON. 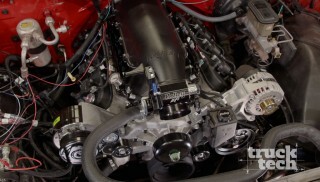 (JESSE)>> CERTAINLY FORD RACING IS TRYING TO STEP UP WITH PERFORMANCE PACKS FOR HANDLING AND INCREASED POWER. YOU NAME IT, WE WANT TO HAVE THE GAME TO COVER IT, INCLUDING A POSITIVE DISPLACEMENT SUPERCHARGER KIT. BOX, AND FLY BY WIRE ACCELERATOR CAN GO ON. THEIR AIR INTAKE IS DESIGNED FOR THE CAR. THIS WE'LL USE FOR THE DYNO. (MIKE)>> MAN FORD HAS GOT THIS ALUMINATOR FIGURED OUT. THIS THING JUST MADE 451 HORSEPOWER AT 6,500 RPM AND 421 FOOT POUNDS AT ABOUT 4,300. MAN THAT'S AWESOME. WHO KNOWS WHAT WE'LL ADD TO IT DOWN THE ROAD. WHATEVER IT IS, WE KNOW IT CAN HANDLE IT. FOR NOW WE'RE INSTALLING THIS ALUMINATOR STOCK, JUST AS IT SITS. GOOD THING BECAUSE THE MUSTANG IS BACK WITH A CLEAN PLACE TO PUT IT. YOU'LL SEE THAT IN THE WEEKS TO COME.